It is necessary for a business to establish regular communications with the subscribers and customers. Then newsletter is an effective communication channel for better communication. Real estate industry also sends daily, weekly, and monthly newsletters to customers for branding and building strong public relations.If you have no idea about newsletter writing, then check out the Business Newsletter Samples below and get access to numerous examples and guides for planning an engaging, appealing, and informative newsletter campaign. 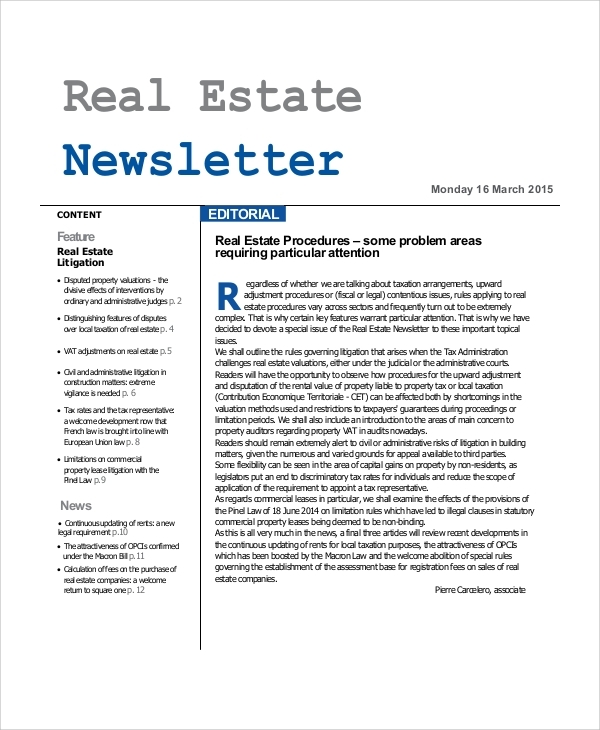 The real estate agent newsletter template is a PDF document available free to download. Open the document and learn how to communicate with the readers using professional copywriting and keen newsletter structure. Newsletter creators and agencies can download this PDF for designing a custom monthly, weekly, or half-yearly newsletter for their customers. Share event news, upcoming events etc effectively through this newsletter samples. 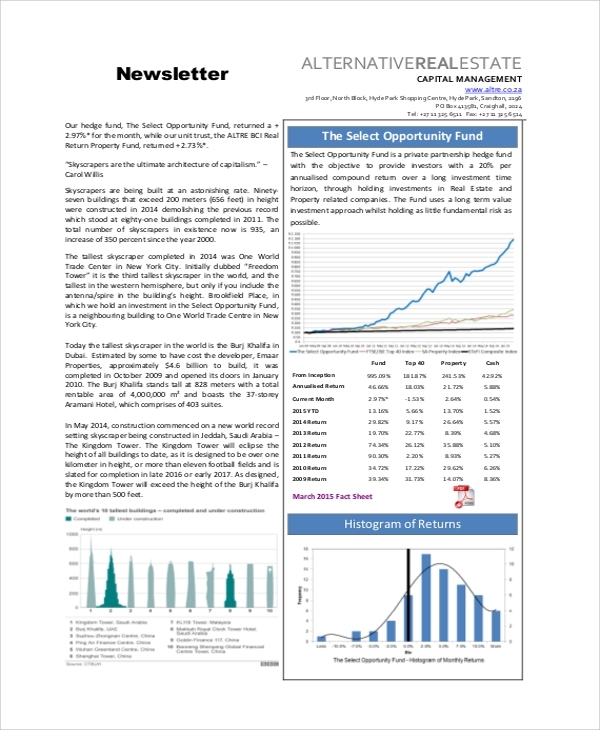 Also, these newsletter samples will enable you to learn effective use and placement of digital content like images and graphics for better visibility and engagement. Real estate is a big industry that has endless opportunities. Also, people love to invest their worth in property as it assures profit for sure. 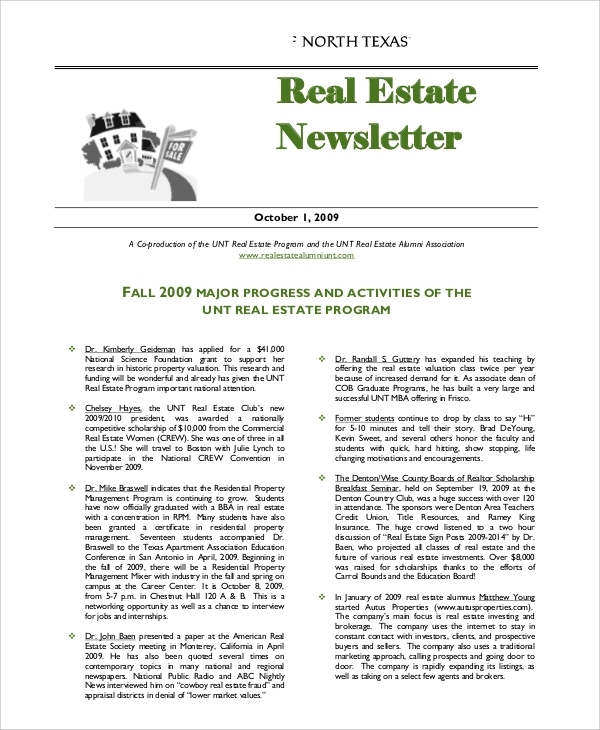 Real estate industry uses newsletters as an effective tool for various purposes. 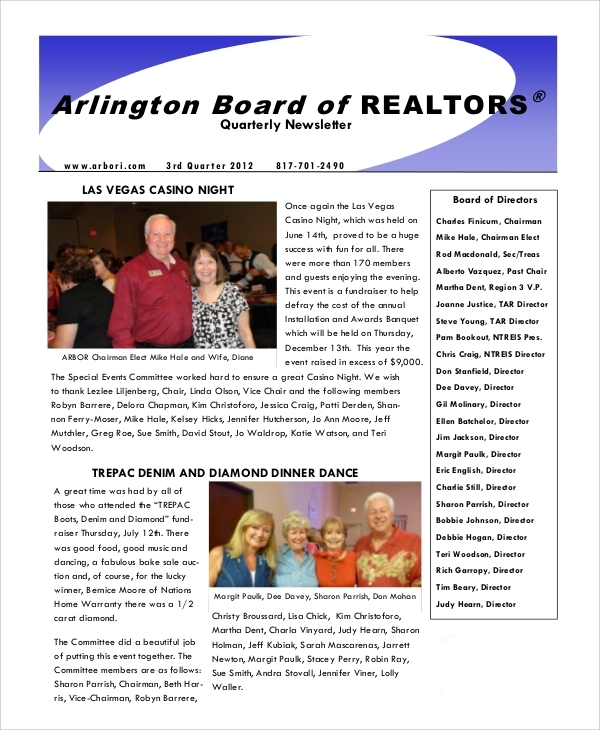 The newsletter helps real estate industry in branding, marketing, and lead generation. Also, it is used for establishing a keen medium for effective communication with the customers. They update the old customers about their policies, services and send irresistible deals for renovation and customization that drives leads and generate sales. Newsletter production is one of the cheapest marketing tools available for businesses. Both print and digital media require cheap finance for campaign generation. Also, it takes less time for campaign planning. So plan custom campaigns by keeping your audience behavior and interest in mind. Newsletter marketing establishes keen communication with the customers and also brings new customers to the doors. You can target the right audience and reach them at the right time that ultimately turns into sales generation. 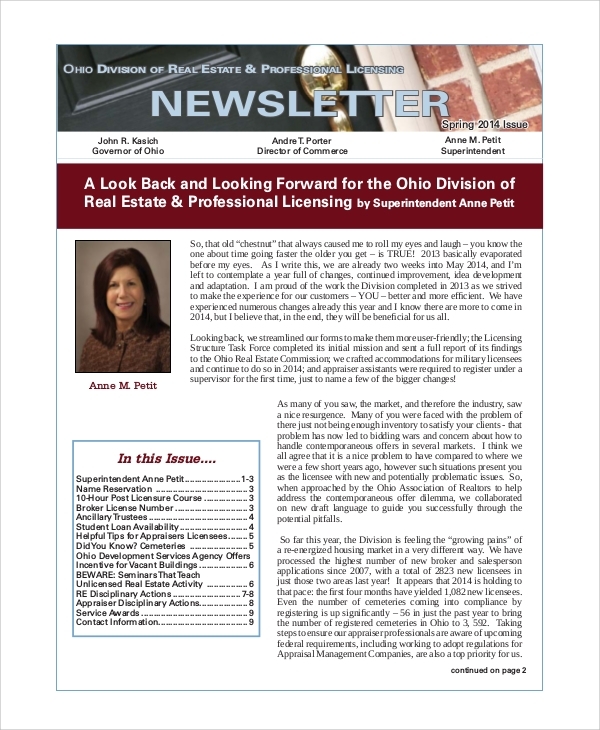 Any individual who belongs to the real estate industry can use the sample real estate newsletter documents for reference. It will help you with ideas for planning custom campaigns that actually works. Also, copywriters, marketers, and digital media agencies working for real estate clients, can use it for planning effective campaigns to increase conversions. Our sample real estate Company Newsletter Sample documents are available in PDF format. Download the documents for free and open it. Our sample documents support all PDF software and web browsers.